Flames approach a pool in the El Capitan Canyon camp as firefighters battle the Refugio fire in Santa Barbara, CA on Thursday, June 16, 2016. 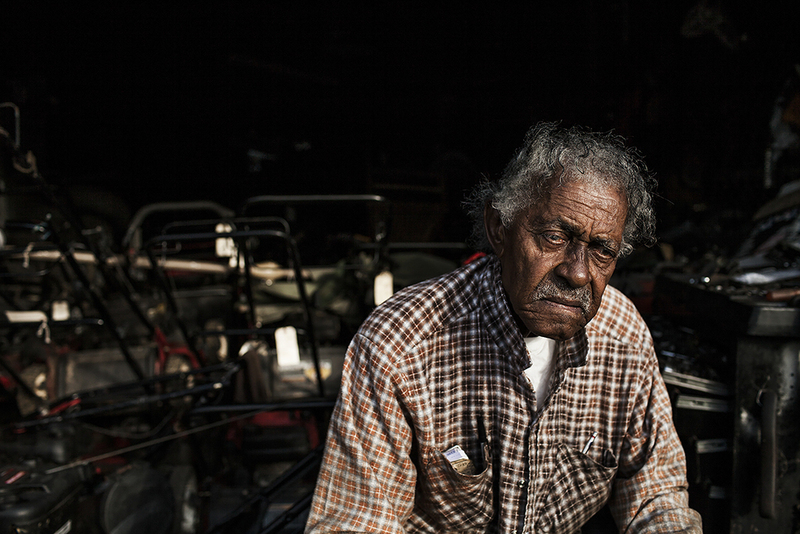 John Daye peers out from his garage where he repairs lawnmowers in Durham, N.C., on August 24, 2014. Daye has been repairing and selling lawnmowers for 21 years since his retirement as an engineer in the tobacco industry. Durham is home to the American Tobacco Company started by J.B. Duke in 1890 that soon became one of the 12 original members of the Dow Jones Industrial Average. The company left Durham in the late 1980’s leaving 1,000 people without jobs. Los Angeles Dodgers Corey Seager breaks his bat in the third inning while batting against the Arizona Diamondbacks on Friday, July 29, 2016. Lucille Ray enjoys a piece of cake during her birthday party on June 29, 2014. Ray turned 108 on June 26, making her one of the oldest people in the county. 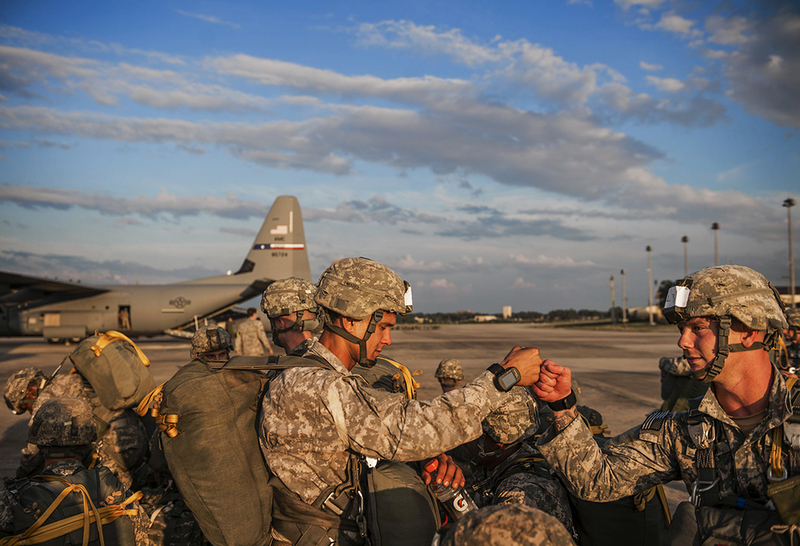 Soldiers of the 82nd Airborne Division bump fists as they prepare for take off during the Emergency Deployment Readiness Exercise on Wednesday, July 15, 2014 at Pope Airfield on Fort Bragg in Fayetteville, N.C. The soldiers have 60 hours before taking flight and parachuting into a training mission at Eglin Air Force Base in Florida. The exercise gives soldiers a chance to hone their skills in case they are needed to jump into a hostile environment or to help provide humanitarian relief. "If it doesn't work out next year, I'll just go and do what I've been doing," Jody Farthing says. "I'll take the MCAT, and I'll apply to med school later on.” SwampDog’s collegiate baseball pitcher Jody Farthing, who holds a 3.9 GPA as a biochemistry at Campbell University, plans to become a doctor if his baseball career comes to an end. "School will never fail," Farthing said. Matthew McCauley is studying to get his Ph.D. in philosophy and hopes to become a professor. Chapel Hill, N.C. January 26, 2015. 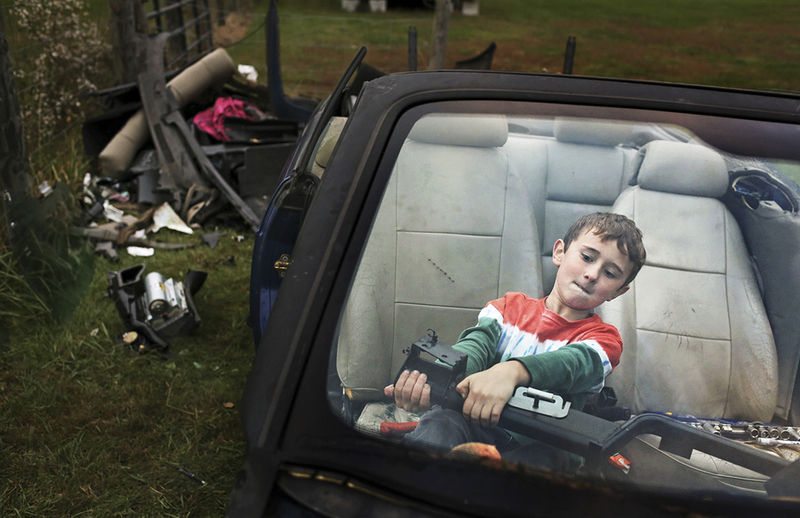 Blake Hendrix, 8, attempts to remove a part of the dash from an old Saab in the front yard of his home outside of Berea, K.Y.. Blake is helping to strip the car for parts to sell with his two brothers and two friends. 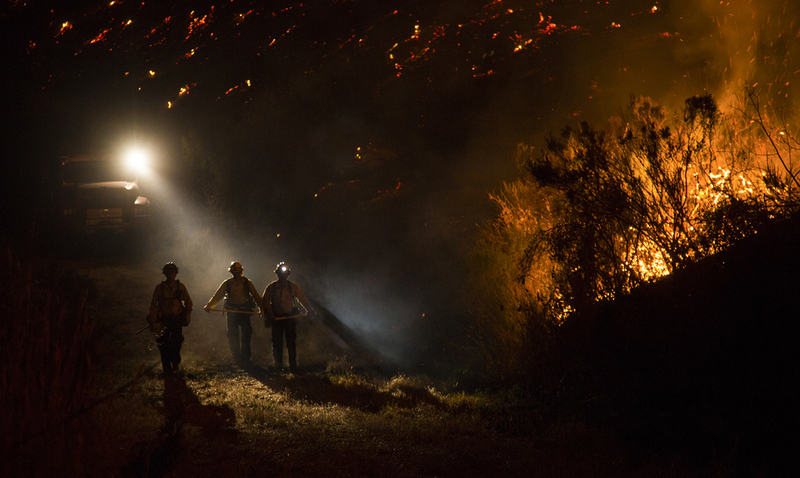 Firefighters fight the Refugio Fire along a trail behind the El Capitan Canyon camp in Santa Barbara, CA. Firefighters continue to fight more aggressive wildfires as the drought continues in California for its fifth year. 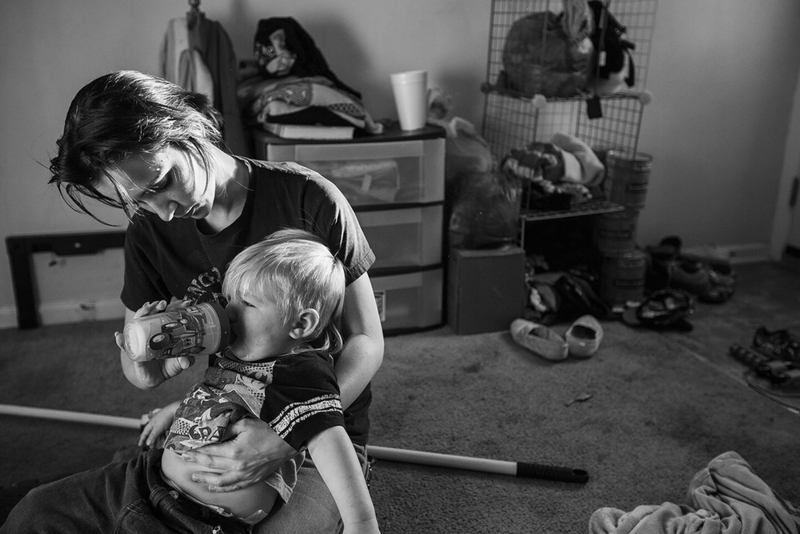 Arielle Morgan comforts her son Dominique, 2, with a sippy cup after he fell while playing in the living room in Durham, N.C. on October 15, 2015. Morgan lives with her mother as they both raise there two eight year old daughters and her son together as single mothers. According to the U.S. Census Bureau, one in four children under the age of 18 are being raised without a father and nearly half (45%) live below the poverty line. Arielle says that it would have been impossible for her to take on the responsibility of raising her daughter on her own at age 16, especially because of her daughters medical bills. Both mothers believe that staying together and raising their children together has transformed their relationship from mother-daughter to roommates and allowed them to handle the financial burdens of being single parents. 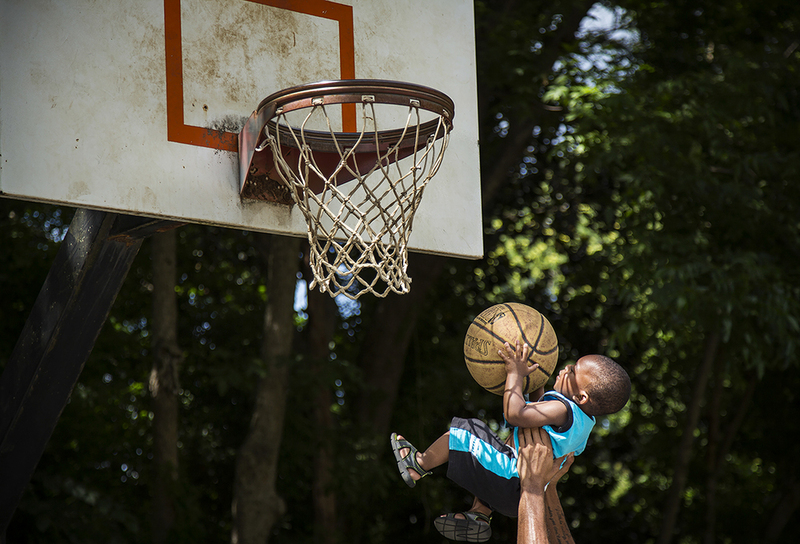 18 month-old Zyhier Gregory is lifted up by his uncle Derrick Conor to shoot a basket while playing basketball with his family in Freedom Park in Charlotte, N.C. on Saturday, June 13, 2015. Zyhier's father Darius Gregory says that Zyhier is learning to play basketball on his Fisher-Price basketball goal at home. Creighton Lovelace, pastor of Danieltown Baptist Church in Forest City, N.C., believes that the confederate flag has strong religious ties and can be traced back to religion throughout southern history. The decades long debate was renewed recently following the racially motivated shootings of nine African-Americans in a Charleston Church. The argument over the flag remains highly debatable as many citizens claim the flag represents a history of hate and racism, while others claim that it is a symbol of their heritage. 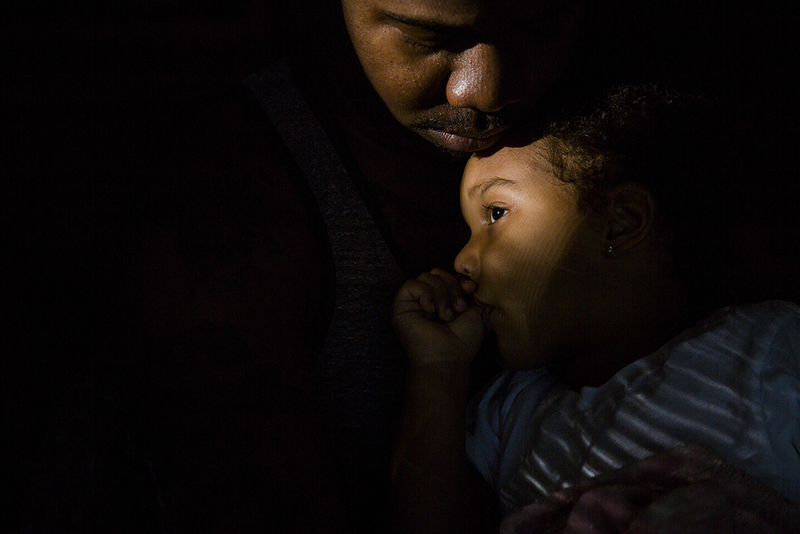 Marques Nash comforts his daughter Demi after a long day of visiting friends and family in Matthews, N.C. on Sunday, May 5, 2015. Nash has an informal custody agreement with Demi's mother which allows them to share the responsibility of caring for her. 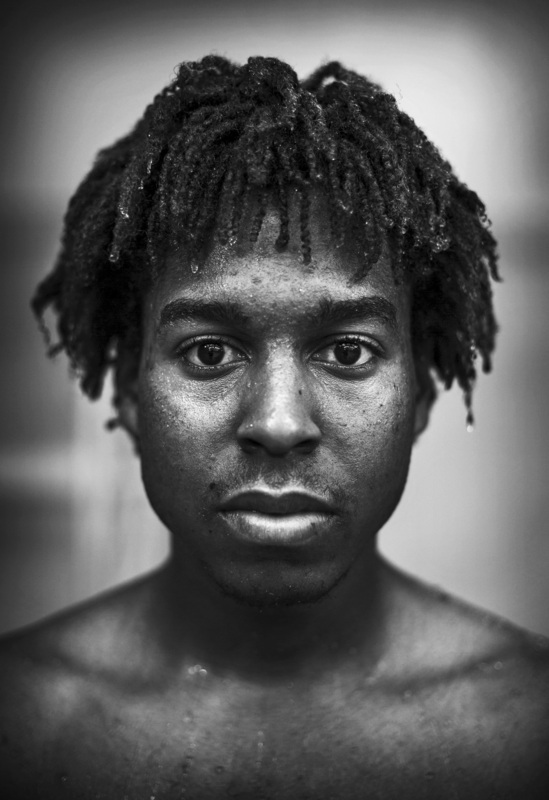 Fatherhood has given him a new purpose in life outside of his desire to become a musician. A diver enters the water while warming up at the Nike Cup finals at UNC Chapel Hill on Friday, November 20, 2015. Morning light shines in through the window as members arrive at a Pentecostal church in Ntcheu District of Malawi, Africa on March 8, 2015. Barbara Pritchett-Hughes yells, "Its done. It's over," as she slams her son, DeAndre Hughes, casket shut at his funeral on Friday, July 29, 2016, after he was fatally shot a week earlier in Compton, CA. Barbara said her mind instantly flashed back to nine years earlier when her 15-year-old son, Dovon Harris, was fatally shot in Watts. As the homicide rate in Los Angeles county continues to plummet, the threat of being shot to death still remains a daily threat.